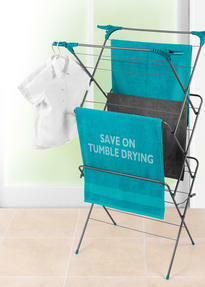 Save money on tumble drying and look after the environment with this brilliant Beldray clothes airer. Perfect for indoor or outdoor use, it is strong and durable so you can leave your washing outside on a warm day and be confident that it will not end up on the floor. With a generous 15 metres of drying space you can use it for clothes, towels or bedding with enough room for a whole load of laundry. 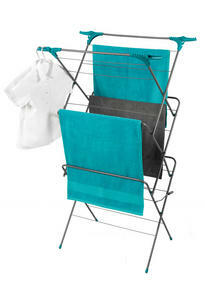 When your clothes are dry, simply fold the airer and conveniently store it ready for next time. Dry your freshly cleaned clothes naturally outside in the sun or in your laundry room on a rainy day using this elegant Beldray airer. Made from steel with a clean powder coated finish, the airer is strong and secure, so you can simply unfold it ready for use. 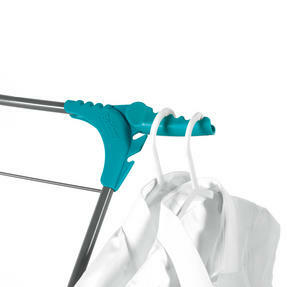 As well as three tiers of space, it has four side wings so you can dry clothes on hangers and move them to the wardrobe afterwards. The racks are made from tough steel with a powder coated finish which will prevent your clothes from slipping off as they dry. 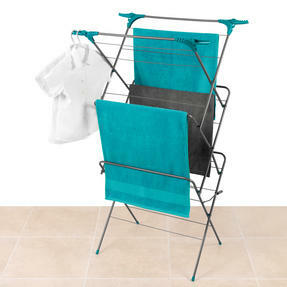 The airer measures 64l x 45w x 138h cm when opened and has a huge amount of drying space, so you can air a large load of laundry.